013 - The Me Kong Delta - Vietnam - 2014 - John Macs Travel & Photography. 013 - The Me Kong Delta - Vietnam - 2014. This morning we took The Mekong River Delta Cruise. This Was a fantastic morning cruise along The Mekong River Delta, stopping off at one of the islands along the way. This region is very fertile for rice, bananas, coconuts, tropical fruit & sugar cane. This is a very luscious, intensively cultivated landscape with a rustic way of life, that makes this area very picturesque and a beautiful place to visit. Mekong River Delta, Island Tour, Vietnam. - 2014. 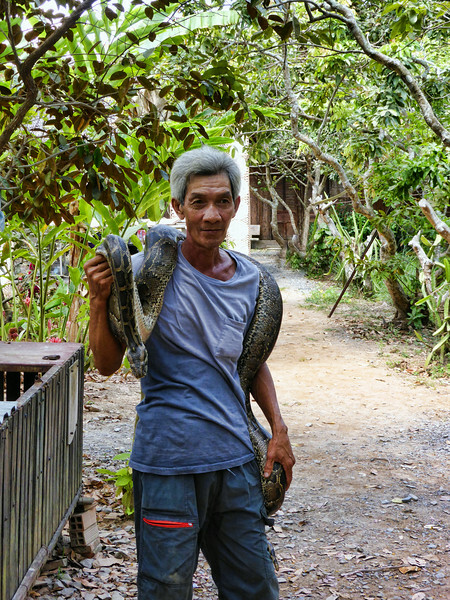 Snake Man On The Mekong River Delta, Island Tour, South Western, Vietnam. - 2014.